Doughnut or donut? We ask the experts. Worldwide icon-chevron-right North America icon-chevron-right United States icon-chevron-right Illinois icon-chevron-right Chicago icon-chevron-right Doughnut or donut? We ask the experts. 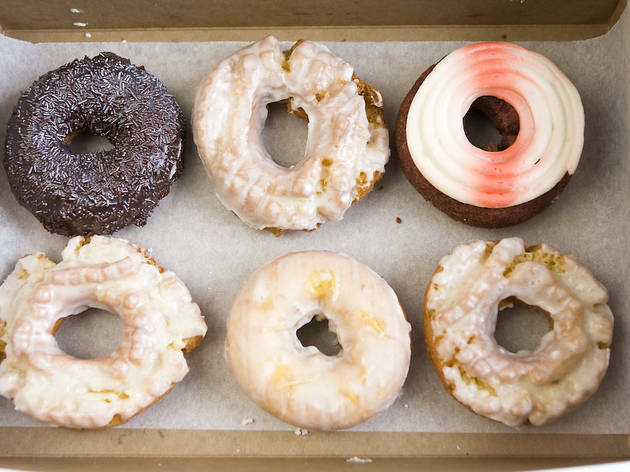 Two Chicago copy editors weigh in on how to spell our favorite ring o' fried dough. 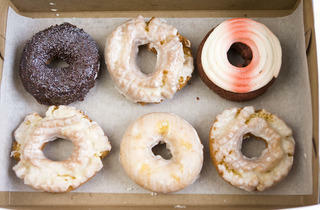 ☻ The entry for doughnut on etymonline.com: 1809, American English, from dough + nut. First recorded by Washington Irving, who described them as "balls of sweetened dough, fried in hog's fat, and called doughnuts, or olykoeks." Meaning "a driving in tight circles" is U.S. slang, 1981. ☻ The entry for donut on etymonline.com: see doughnut. Carol Fisher Saller (senior manuscript editor at the University of Chicago Press and author of The Subversive Copy Editor): "I'm sure you couldn't possibly have known that next to pizza, donuts are my favorite food. (Oh—maybe that's why you picked me to ask?) Anyway, as you can see from the previous sentence, I favor 'donut,' because it's easier to type, but if I were editing something, I'd go with our house dictionary, Merriam-Webster's 11th Collegiate, which calls 'donut' a variant of 'doughnut.' Either way, it's important to remember that cake donuts are superior to raised!" Rebecca Maughan (freelance copy editor and former copy chief at Time Out Chicago): "I have had *three* doughnuts already today, so take my word for it: It's spelled 'dough' because it's got dough in it. Dunkin' Donuts may choose its brand name because it's clever and short, but that doesn't dictate how all Americans should spell the word. There's a product called Weed B Gon too, but we don't change the spelling of 'gone' because of it."